In October of 1918, Spanish Flu broke out in Saskatchewan, carried home by soldiers returning from the First World War. By the end of 1918, nearly 4,000 people in Saskatchewan had died of the disease. The illness highlighted the disadvantages people living in rural areas faced in trying to obtain healthcare. Rural hospitals were few and far between, and many communities had no doctor and no means of treating the disease. Early on, farm women such as Violet McNaughton called for an increase in rural healthcare advocating for programs such as nurse training, but these calls went largely unheard. Not only were rural communities unprepared for the epidemic due to the lack of available healthcare, but the available treatments were often out of reach. At the time, alcohol was considered one of the best treatments and preventative medicines for the Spanish Flu, but prohibition was still in effect. In a desperate attempt to treat the Flu, the provincial government permitted pharmacists to dispense alcohol if they deemed it necessary, but for communities without a pharmacist, this did little good. The lack of adequate healthcare meant that death rates from the Flu in villages and rural areas were nearly twice as high as the death rates in urban centres in Saskatchewan. The death rates on First Nations and at residential schools may have been even higher. The lack of healthcare that caused much of the suffering for individuals and families in rural areas was even worse in First Nations comminities. The RCMP quarantined First Nations that had recorded the illness, but the focus of the quarantine was to prevent the spread of illness to settler communities, not to protect the Indigenous communities where the flu was already present. Though it was a tragic time in Saskatchewan’s history, changes were made across the province because of the Spanish Flu experience. Rural municipal doctor programs, where a municipality would pay the wages of a doctor to keep him in the community instead of individual farmers paying for medical treatment when necessary, were a precursor to nation-wide Medicare. Vaccines also rose in popularity in response to the crisis, and the establishment of rural hospitals became a priority for communities. The first female MLA in Saskatchewan was also elected as a result of the Flu. Sarah Ramsland won her seat in the provincial legislature after her husband, Magnus Ramsland, died of the Flu. The provincial Liberal party put her forward as a candidate in an effort to help keep her and her family from poverty by providing her with a salary. She won the election and sat in the legislature for six years until losing the 1925 election. The WDM Saskatoon has a small exhibit on the Spanish Flu. 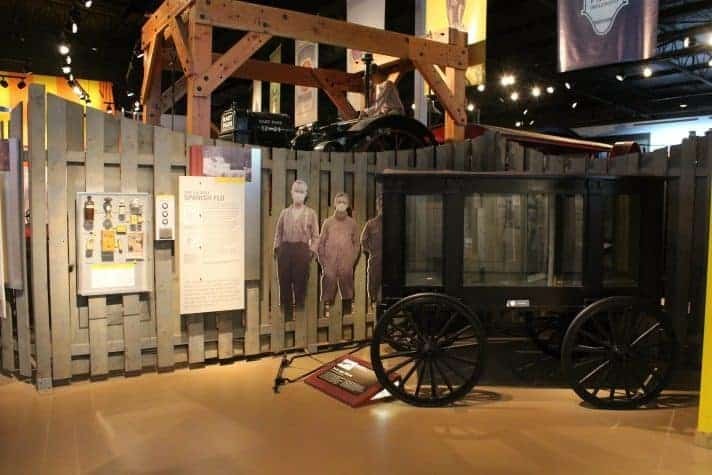 Located in the Winning the Prairie Gamble section, right across from the sod house, is a hearse and a panel describing the impact of the Flu on Saskatchewan communities. In addition to this, there are three personal stories that can be listened to, which further drive home the devastation caused by the Spanish Flu. To learn more, visit the WDM Saskatoon. Lux, Maureen Katherine. 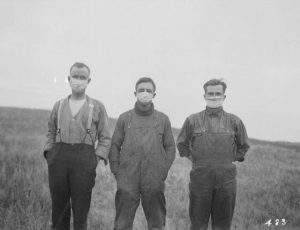 The Impact of The Spanish Influenza Pandemic in Saskatchewan, 1918-1919. Master’s thesis, University of Saskatchewan, 1989.